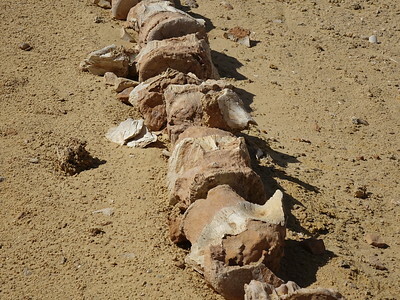 Wadi Al-Hitan (Whale Valley) is the largest and most important site in the world for whale fossils. The fossils belong to a now extinct subspecies of whales, which shows their transition from land animals to marine mammals: they still have hind legs. The fossils have been found on the surface in a now completely dry desert landscape, which was part of the enormous Tethys Ocean 40 million years ago. The fossil whales were first discovered during the winter of 1902-03. 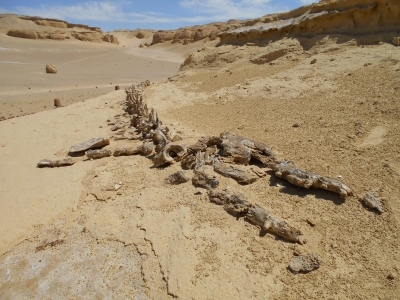 Wadi Al-Hitan (the Whale Valley) is “the most significant site in the world to demonstrate the evolution of whales”. The valley lies 190km south of Cairo in Egypt’s Al Fayoum area, to which the Dutch foreign travel advice still applies the label “necessary travel only”. Well – it was necessary for me! There is no reason to avoid this region nowadays. Large tour groups are assigned escorts according to the Lonely Planet – and indeed we met a tourist convoy of 4x4’s accompanied by armed police. I was with a local driver (who seemed to know everybody) and we were just waved on at the only checkpoint near Lake Qarun. In the early morning I was picked up at my Cairo hotel with a 4WD jeep. Due to the busy traffic, getting out of (and into) Cairo is quite time-consuming. Once outside the city limits we hardly saw anyone anymore. The road has been completely paved up to the last 32km, but occasionally some sand hills have blown over the road and a 4WD (or just high clearance) is helpful. The final stretch is on a reinforced sand road. My driver found it more fun to drive off-road though. Some 3 hours after our departure we arrived at the Wadi. This is one of the most modern and best organized attractions in Egypt. There is a demarcated parking space, a café, clean toilets and a brand new museum. All these outbuildings are made in an adobe style so that they fit exactly within the landscape. Entrance costs 40 Egyptian pounds (2 EUR). Only since 1983 has research been done on a large scale and has the importance of these fossils been discovered. In 2005 it became a WHS and since then it has been made accessible to visitors. This has been done with Italian technical and financial support, via a twinning agreement between Wadi Al-Rayan (the national park in which the whale fossils lie) and Italy’s Gran Sasso National Park. We started our tour at the Fossil and Climate Change museum, only open since 2016. It is small but does its job of explaining the importance of the site well. The largest whale species found on site is the now extinct Basilosaurus isis, which still had small hind legs but they were not strong enough to stand on anymore. In the museum they do have a full skeleton of this species. You can also see fossilized plants and shells. There is even a fossil of a watermelon! You can only enter the fossil area on foot, via a hiking trail of about 2km length. Fortunately, it was a bit windy the day that I visited - walking through the sand in the burning sun otherwise would be quite a test. I noticed a guide from a Spanish group pointing the start of the trail out to them and immediately returning to the shelter of the café himself. My guide went along, but had little added value on this trip. From the main trail there are numbered signs pointing to side paths where you can see a fossil or something else of interest. Although there is also a complete skeleton, mainly spines from the whale fossils can be seen. The fossils lie in the open air - we wondered what happens to them when there is a sandstorm or when it rains (if it ever rains here). Probably they are somehow fastened to the soil at the bottom. When this area was under water and the whales lived here, this valley was a coastal area with mangroves. You can see these plants as well fossilized in the landscape. Further down the valley, the number of whale fossils decreases but the landscape becomes more and more beautiful. There are strangely eroded hills, like giant mushrooms. We walked almost the entire path, except for the last hill with a mysterious sign 'Exit' - you really have to return the same way though as you came. From Cairo this is a full day trip: I left at 7:30 and was back at the hotel at 6 o'clock. The visit to the valley itself took about 2 hours. The landscape is beautiful and the story behind the whale fossil findings I found intriguing. This side trip is also a nice change from busy Cairo and the many monuments from Egyptian antiquity. On both ways we passed Lake Qarun, part of the TWHS that is up for a separate nomination in 2020. Especially from the western side this huge lake suddenly appears as an oasis in the desert. I visited this WHS in April 2017 on the day before leaving Egypt. I'm an amateur paleontologist and fossil collector, so visiting Wadi Al-Hitan was already in my plan besides seeing the ancient civilization. Since collecting Natural WHS is harder than the cultural one, I was determined to put this on my list as it's not too far from Cairo. But it wasn't easy at all. Because I was traveling alone, all the travel agencies at the Tahrir Square could only put me in the waiting list for a bigger group. I was lucky when a group of 7 foreign students studying in Cairo University decided to join the tour. So we took off quite early in the morning as the journey to the first stop took a solid 3 hours. The first stop was a place with a lot of round rocks formation where they called it "watermelons". At this desert site you can clearly see the mark of ancient water flow. Then we went to the on site museum where you could see the evolution of the whale (Basilosaurus isis) where the small hind limbs still attached to the big body. The in situ fossils are just next to the museum with numbers along the path. Besides the whale fossils you can also notice a lot of sand dollar fossils around. In my opinion this is a very educational fossil site even for an ordinary person as one can imagine how the environment and life was long ago. All in all I think this is a very interesting site and WHS one shall not missed. We drove to wadi al-hitan during our Egypt travel in February 2015. It was quite a drive from Cairo but great scenery on the way. It’s nice to drive through rural Egypt. The site is amazing with the skeletons and the views. I would recommend everyone to go here if you have the option. We did not camp ourselves (not so fond of camping) but I can imagine that’s a great experience too. Nearby there are some waterfalls too to explore. For in-depth photos have a look at my page. In 2008 was an undergraduate working on a dig at Karanis, an early Greco-Roman site about 50 miles outside of Cairo and Wadi Al-Hitan was one of the places where we made field trips out to study. It is, beyond measure, one of the most powerfully beautiful places that I have ever been to. The vast, echoing quiet and uniquely shaped landscapes were breathtaking. Trying to come to terms with the fact that 40 million years ago we would have been on the bottom of the ocean while in the middle of the Egyptian desert was both humbling and awe-inspiring. It is not a well-traveled site but is well looked after, and worth the side trip if at all possible. I went there with my son in July 2011, and if I read the elder reviews a lot has changed. I came with my own car and the road was, although not paved, reasonably good. It was a very hot day, we left very early in the morning from Tunis, but of course you are never early enough when the summer-sun is burning in Egypt. You do not need any police-permission anymore (anyway there is hardly police in Egypt after the revolution), you just buy a ticket before wadi el Rayyan. The first part of the road is passing sand-dunes and the lakes, beautiful!! The second part white sand, mostly flat, the white is burning in your eyes. There was only one person at Wadi Hitan, showing us where to start the 3 km long walk. We were very happy to walk on what was 40 million years ago the bottom of the ocean. Everywhere you see little or bigger sand-hills (over 6000), covering the fossile rests of all kinds of ocean-habitants. Fantastic. We were there all alone, if we were bad people we could have taken fossile vertebra's or ribs... (of course we are not). We loved the landscape so much! We were wondering who is taking the sand away after a sand-storm... We finished our walk at 10.00 h and that was just in time! I am advising you to go as early as possible in summer. We went in April 2010 and it is an incredible place. We went with an Egyptian Guide and Driver and arrived about 4pm, perfect timing as most visitors had gone so we had the whole place to ourselves and watched the sun setting and creating amazing colours on the surrounding rocks. Seeing the 40 million year old fossils and bones was incredible - the place is covered with mangrove fossils too. We then camped overnight there - waking up at 3am to see the moon up and looking out at such stunning scenery was something I will never forget. The highlight of our tour to Egypt. We went in October (2008) which was a perfect time of year with the afternoon sun showing off the rich colours of this pristine desert landscape. Once well inside the Wadi Al Rayan national park, there is a 35km dirt track at the end of which is a simple but orderly visitor centre for Wadi Al Hitan, nestled at the bottom of a cliff. From there a couple of short circular walks are laid out, along which fossils have been strategically laid. It’s very tastefully done however. The only trips available on the internet seem to be as part of expensive package tours but we hired a local to take us from the city of Al Fayoum. Make sure you leave before it gets dark and avoid in mid summer or if there has been heavy rain. Technically, all foreign tourists in Al Fayoum region should be accompanied by police for protection, but if you’re discreet it shouldn’t be necessary. Preferably travel with Egyptians.